Back in May I went on a cruise from Fort Lauderdale, Florida. I'd been visiting my son and his family in Jacksonville, and drove down from there to catch the cruise. Well one of my hobbies, in addition to painting, is bird watching. Being in southern Florida might well give me the chance to see birds I'd be unlikely to see in my more northerly climes, so I googled for spots to look for birds that were along my route. I found a newspaper article that detailed several good places for bird watching in south Florida. I knew I could not visit all of them, or even most of them, and many were way out of my way. But I decided to make a visit to Grassy Waters Preserve as it was on my direct route and appeared to be pretty close to I-95. Perhaps the other spots are just as lovely, but Grassy Waters was an absolute gem. I don't see how I could have picked a better spot. Just a mile or two inland from glossy West Palm Beach is this marvelous habitat like a mini Everglades. I spent over an hour there walking the trails, taking photos, watching the birds. It was so marvelous that I stopped there for another hour on my way home from the cruise also. 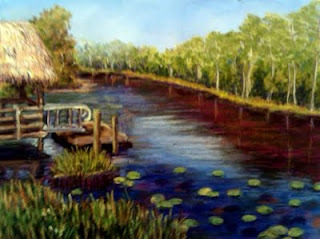 It just seemed like a natural to paint a picture of the place, maybe more than one! So I did this painting last night, my usual 9x12 Art Spectrum, of the pond at entrance to the preserve. There are signs there warning of alligators, but though I looked hard for them on both trips I didn't see a single one.